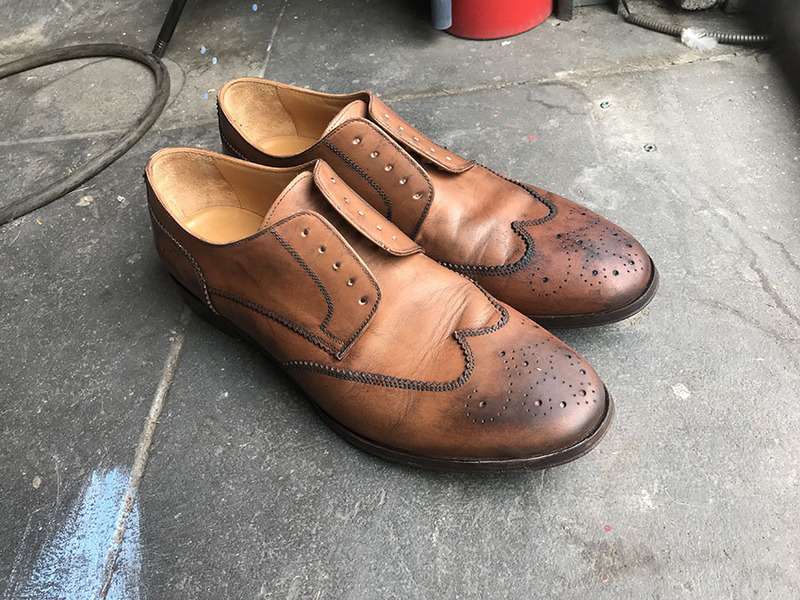 A few weeks ago, a gentleman came to visit me with a pair of fine leather shoes he'd bought in Italy. The shoes were fine, but he accidentally dropped an ink on his left shoe & by trying to remove the stain, a grievous mistake was made. He came to us as a last resort. This is what happened in his own words. ""There was a shoe shop that didn’t really make an attempt to fix the original stain. Then my mom tried using a little bit of soap and water and that didn’t work. A few compounded errors but it is what it is." By trying to remove the stain, it also removed the top grain portion of the leather. It looked quite severe so I immediately applied some leather soap & creme. I believe I have done at least 6 sessions of applying the combination of Leather Soap, Creme, and Oil... then tanning under the natural Sun. Then, finally, I saw the pair coming to life after staying 3 weeks in our Studio. Below are the final results. Overall, it was a fun & learning experience. If you have a stain or any issue, please consult with the professional before causing a further damage.